Charging Into 2019: the IPJ Real Estate Team Makes Resolutions! It's that time of the season. A time for transitions. A time to consider where we've been and where we'd like to go. Many of us subject ourselves to the obligatory resolution-making when the new year rolls around; some of us do so with great enthusiasm while others, perhaps, just because it's expected. We've thought about this resolution-making tradition a bit, and wanted to share our findings! Conclusion #1: you have to absolutely want the change, deep down and in your heart of hearts, otherwise, save yourself the unnecessary false starts and feelings of failure. You've got better things on which to focus your energy! Conclusion #2: success doesn't come from the goal-making, it is all about the action steps (and subsequent habits you create) in order to achieve those goals. That's where the momentum lies - in the do-ing. So once you've established the 'what', do yourself the favor of establishing quantifiable 'hows'! And remember, baby steps accumulate fast - it's OK to start small! from Beth Stanway: "Retain a student mentality. I always want to be learning about new legislation, real estate best practices and property trends and news. Not just because I need a CE credit!" from Amey Ryan: "Be a Navigational Beacon - When you work in the real estate industry, the most common question is 'How's the market?' That can be a loaded question and we spend a lot of time talking to the general public and potential clients and customers about the market in a conversation that is typically quite general in nature. However, when someone really wants to drill down and talk about the market as it relates to their home or property, or one they're thinking of purchasing, a targeted approach is a must. In the new year, I'd like to be more direct with folks about that difference." ...and an invitation to all those with burning questions (or reservations!) regarding real estate: make it a resolution to use the resources at hand (the IPJRE team) for their expertise! We offer our time on a consultation basis, so if you have specific questions or are making future plans, please know that we are ready, willing and able to spend time with you to help navigate those paths. We'd like to help you plan for the future, now! Cheers for a Happy and Healthy 2019! We'll be taking action, likely through very small steps, right alongside you! * curious about the photo!? 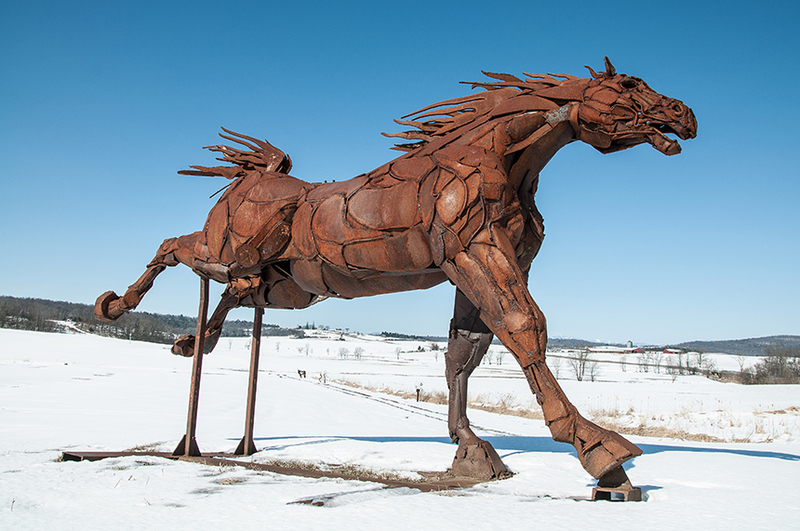 The sculpture is called "Wild Mustang" by Artist Martin McGowan, and is one of the many incredible sculptures available for public viewing at the Lemon Fair Sculpture Park in Shoreham (best during warmer months when the fields are officially open for wandering). For more info, visit their website HERE!